HitPixels are loose collective of game enthusiasts from Prague (Czech Republic) formally formed in summer 2012. Their personal goal is to spawn tiny but fun mobile games and have splendid time while doing so. Their main target platform is Android. HitPixels were formed (like every good band or art group) in pub. Two basic ideas were picked from bag of clever and semi-sober ideas and machine of production was put in motion. Plan was to make it easy, fast and try to finish something. That's why libGDX was picked as main framework and it repeatedly proved as really lucky choice. Fast forward and there comes October 30, 2012, memorable day of first HitPixels release. 'Cultist' did (and actually still is doing) quite well for simple vintage game without proper marketing campaign. 'Duel' was released a month later and that concludes a short period of learning ropes. From that moment is HitPixels working on several new ideas and trying make something bigger and full featured. 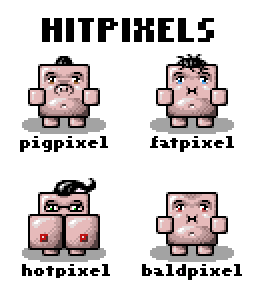 There are far more images available for HitPixels, but these are the ones we felt would be most useful to you. If you have specific requests, please do contact us!